The early history of this little car is not known. 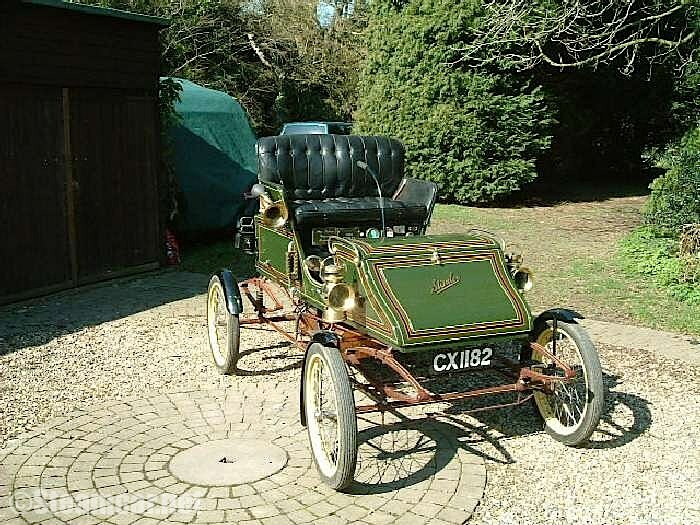 It was imported from America, where it had been built by "The Stanley Motor Carriage Company" in 1904, by the sole agent F Wilkinson in Manchester. Whether it was imported new or second hand is unclear. We do know that Richard Shuttleworth bought it in 1931. He intended to fit a new boiler and have the engine overhauled. The boiler and the engine were removed but had not been replaced when he was killed in flying accident in about 1937. The car then remained in the Shuttleworth Collection until Guy Black bought it for restoration in 1987. It seems that Guy did not undertake the restoration himself but sold the car on to Geoff Harris, who, in conjunction with the late Phil Hopes, set about a complete mechanical overhaul of the car, a new boiler was made and a matching engine found, which may in fact be the original. The car has successfully completed several commemorative runs to Brighton most recently in 2004. The car is fitted with a small multitube (316 of them!) boiler operating at 300 psi. The engine has twin high pressure, double acting cylinders with bores of 3" and a 4" stroke. This engine is mounted under the car and is integral with the back axle and final drive. The burner is powered by vaporised petrol at 80 psi. and is started in much the same way as a Tilley lamp or Primus stove, using propane (originally acetylene) to heat the vaporising tubes prior to ignition. Petrol consumption is about 10 mpg. The feed water is held in a tank which surrounds the boiler so that the feed water is preheated, and the water consumption is about one gallon per mile giving a range of 20+ miles. These small steam cars have a very good power to weight ratio and can move quite rapidly where safe to do so. The braking system is somewhat primitive so considerable care has to be taken on the road. In addition to the two obvious seats on top of the body, there is accommodation for a further two passengers at the front of the car when a backrest is lifted and a footrest dropped down. The original crumple zone! Mr Michael Parr, Kensington, London.